Cannabigerol is one of more than 120 identified cannabinoid compounds found in the plant genus Cannabis. Cannabigerol is the non-acidic form of cannabigerolic acid, the parent molecule from which other cannabinoids are synthesized. Cannabigerol is a minor constituent of cannabis. During growth, most of the cannabigerol is converted into other cannabinoids, primarily tetrahydrocannabinol or cannabidiol, usually leaving somewhere below 1% cannabigerol in the plant. ^ a b Morales, P; Reggio, P. H; Jagerovic, N (2017). “An Overview on Medicinal Chemistry of Synthetic and Natural Derivatives of Cannabidiol”. Frontiers in Pharmacology. 8: 422. doi:10.3389/fphar.2017.00422. PMC 5487438. PMID 28701957. ^ a b c d Morales, P; Hurst, D. P; Reggio, P. H (2017). Molecular Targets of the Phytocannabinoids – A Complex Picture. Progress in the Chemistry of Organic Natural Products. 103. pp. 103–131. doi:10.1007/978-3-319-45541-9_4. ISBN 978-3-319-45539-6. PMC 5345356. PMID 28120232. ^ Cascio MG, Gauson LA, Stevenson LA, Ross RA, Pertwee R (December 2009). “Evidence that the plant cannabinoid cannabigerol is a highly potent alpha(2)-adrenoceptor agonist and moderately potent 5HT receptor antagonist”. British Journal of Pharmacology. 159 (1): 129–141. doi:10.1111/j.1476-5381.2009.00515.x. PMC 2823359. PMID 20002104. ^ Page Et. Al, Jonathan (2012). “Identification of olivetolic acid cyclase from Cannabis sativa reveals a unique catalytic route to plant polyketides”. PNAS. 109 (31): 12811–6. doi:10.1073/pnas.1200330109. PMC 3411943. PMID 22802619. ^ Meinhart H, Zenk Et. Al (1998). 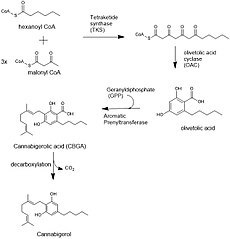 “Prenylation of olivetolate by a hemp transferase yields cannabigerolic acid, the precursor of tetrahydrocannabinol”. FEBS Letters. 427 (2): 283–285. doi:10.1016/s0014-5793(98)00450-5. PMID 9607329. ^ Couch, D. G; Maudslay, H; Doleman, B; Lund, J. N; O’Sullivan, S. E (2018). “The Use of Cannabinoids in Colitis: A Systematic Review and Meta-Analysis”. Inflammatory Bowel Diseases. 24 (4): 680–697. doi:10.1093/ibd/izy014. PMID 29562280. ^ Borrelli, F; Fasolino, I; Romano, B; Capasso, R; Maiello, F; Coppola, D; Orlando, P; Battista, G; Pagano, E; Di Marzo, V; Izzo, A. A (2013). “Beneficial effect of the non-psychotropic plant cannabinoid cannabigerol on experimental inflammatory bowel disease”. Biochemical Pharmacology. 85 (9): 1306–16. doi:10.1016/j.bcp.2013.01.017. PMID 23415610. ^ Valdeolivas, S; Navarrete, C; Cantarero, I; Bellido, M. L; Muñoz, E; Sagredo, O (2014). “Neuroprotective Properties of Cannabigerol in Huntington’s Disease: Studies in R6/2 Mice and 3-Nitropropionate-lesioned Mice”. Neurotherapeutics. 12 (1): 185–199. doi:10.1007/s13311-014-0304-z. PMC 4322067. PMID 25252936. ^ Granja, A. G; Carrillo-Salinas, F; Pagani, A; Gómez-Cañas, M; Negri, R; Navarrete, C; Mecha, M; Mestre, L; Fiebich, B. L; Cantarero, I; Calzado, M. A; Bellido, M. L; Fernandez-Ruiz, J; Appendino, G; Guaza, C; Muñoz, E (2012). “A cannabigerol quinone alleviates neuroinflammation in a chronic model of multiple sclerosis”. Journal of Neuroimmune Pharmacology. 7 (4): 1002–16. doi:10.1007/s11481-012-9399-3. PMID 22971837. ^ Śledziński, P; Zeyland, J; Słomski, R; Nowak, A (2018). “The current state and future perspectives of cannabinoids in cancer biology”. Cancer Medicine. 7 (3): 765–775. doi:10.1002/cam4.1312. PMC 5852356. PMID 29473338. ^ Soderstrom, K; Soliman, E; Van Dross, R (2017). “Cannabinoids Modulate Neuronal Activity and Cancer by CB1 and CB2 Receptor-Independent Mechanisms”. Frontiers in Pharmacology. 8: 720. doi:10.3389/fphar.2017.00720. PMC 5641363. PMID 29066974. ^ Brierley, D. I; Samuels, J; Duncan, M; Whalley, B. J; Williams, C. M (2016). “Cannabigerol is a novel, well-tolerated appetite stimulant in pre-satiated rats”. Psychopharmacology. 233 (19): 3603–3613. doi:10.1007/s00213-016-4397-4. PMC 5021742. PMID 27503475. ^ Fernández-Ruiz, J; Moro, M. A; Martínez-Orgado, J (2015). “Cannabinoids in Neurodegenerative Disorders and Stroke/Brain Trauma: From Preclinical Models to Clinical Applications”. Neurotherapeutics. 12 (4): 793–806. doi:10.1007/s13311-015-0381-7. PMC 4604192. PMID 26260390. ^ “USC > Title 21 > Chapter 13 > Subchapter I > Part A > § 802. Definitions: (16)” (PDF). Government Publishing Office – US Code. 2016.